On July 17th, companies small and large came together to celebrate what’s become a mainstay in our digital communications: the emoji. Developed between 1998 and 1999 by Shigetaka Kurita, emojis were first added to smartphones in 2001 and quickly rose in popularity due to their ability to communicate items and emotions in a simple, cartoon-like visual. According to New York Magazine, 74 percent of the people in the United States confirmed using emojis in messaging apps. On social media, Twitter alone sees 470 million uses of the Joy emoji at any given moment. With so many uses for the emoji, the challenge and opportunity for companies becomes how to utilize them in a way that’s on brand and adds value to their overall digital content efforts. Look no further than brand activations around World Emoji Day for inspiration on how to incorporate emojis into your digital content. From movie re-enactments to custom keyboards, portraits, educational tours, and company culture, here are five examples that took emoji-themed content to the next level. One of the more involved activations of World Emoji Day came from Disney, which created a two and a half minute video featuring emojis re-enacting Frozen. Featuring only sounds, music, and emojis, the video is both clever and uniquely Disney. What better way to celebrate World Emoji Day than with a set of emojis customized to your brand? While Victoria Secret is not the first company to do this, customized emojis offer a way to give fans something that they can enjoy—all for free. Plus, some of the emojis are branded, allowing advocates to help drive word-of-mouth endorsement about the Victoria Secret brand both in personal and social media conversations. On World Emoji Day, many brands tapped into emojis related to their product or service offerings. NASCAR took it a step further by creating portraits of its drivers made solely with emojis. The end result has a mosaic-like quality. Interestingly, it’s not as difficult as one might imagine to create these images—there’s an app for that. Called Emojify, it turns your photos into mosaic collages filled with emoticons. The Smithsonian took a unique approach to #WorldEmojiDay by taking fans on an emoji tour of its museums. Using Storify, items such as Lincoln’s silk hat, Louis Armstrong’s trumpet, and even fossilized sloth dung are featured with their corresponding emoji. The effort is a great example of how a timely occasion and emojis offered an engagement opportunity to take fans inside their 19 museums. Plus, Storify integrates nicely with Twitter to have a visual slideshow experience. 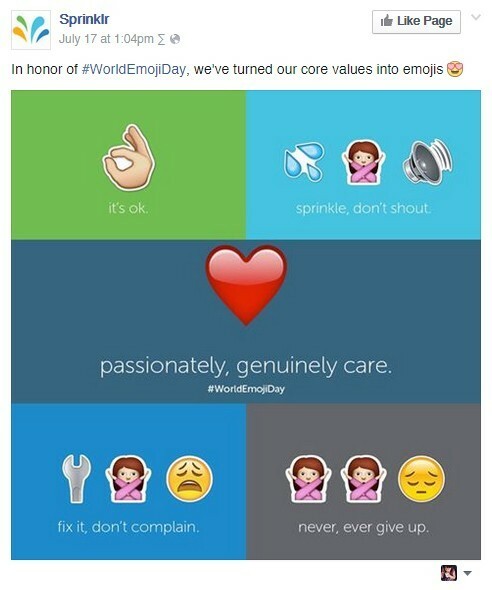 Last, but most certainly not least, I would be remiss in not featuring the fun we had at Sprinklr on World Emoji Day. With a passionate, social media-savvy workforce, our team created a photo album with employees starring as their favorite emojis. This concept offers a great reminder that it’s important to get employees involved in these types of occasions or campaigns, especially when it’s related to their job function. As part of World Emoji Day, we also re-created the Sprinklr core values with emojis, offering an opportunity to shine a spotlight on Sprinklr’s company culture. Hungry for more? There are a number of interesting examples of how brands have used emojis to help consumers improve communication, donate to charitable causes, and even order pizza.